After transporting wagons by rail, the newly torn iron and steel rose vertically. Steel and glass windows are emerging in major cities to sell the new flow of industrial goods. Galerie Bortier appeared in 1848 within this frenzy and specializes in print. An industrial revolution later, Brussels is open from one end to the other by the North-South junction. The Bortier Gallery, located in the center of this urban scar has strangely survived. It is at its n ° 7 that, from September 20 to October 12, 2018 creations of François Schuiten were exhibited. An artist as much concerned by the urban chaos of his city as the beauty of a locomotive. 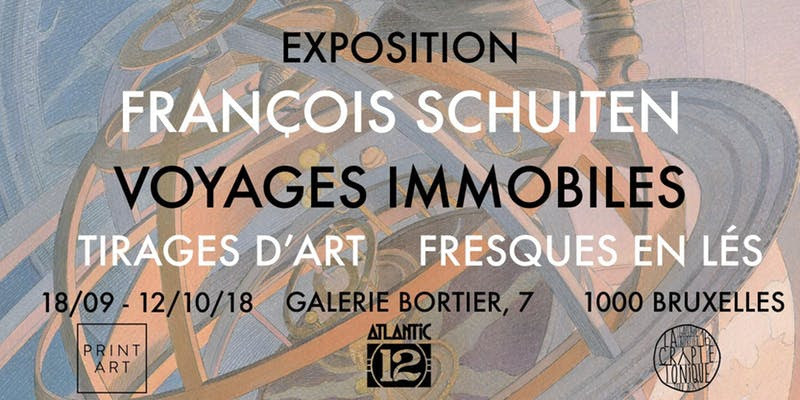 Voyages Immobiles presented wall paper with images by Schuiten as well as a retrospective of all the editions realised by Atlantic 12 since its creation at the end of 2015. This exhibition located in the city center of Brussels (close to the Grand-Place) in the magnificent and too little known Bortier Gallery was proposed by Atlantic 12 and Print'Art with the support of La Crypte Tonique and all the booksellers of Bortier Gallery. Photos by Atlantic 12 and Théo Strato.